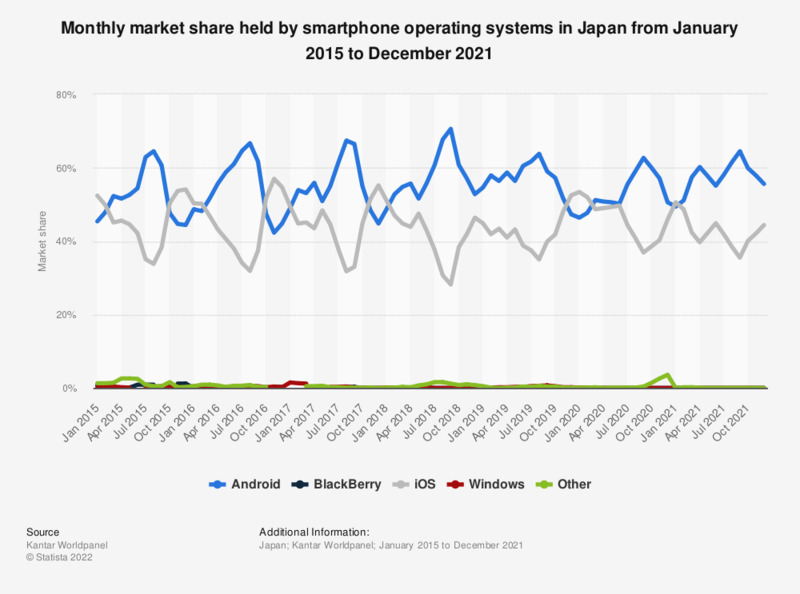 This statistic shows the market share held by the leading operating systems in Japan based on smartphone sales from 2013 to 2018. In December 2018, the iOS operating system had a market share of 46.4 percent, compared to the Android OS with a 52.8 percent market share. Samsung's Android was the most widely used operating system in Japan throughout most of 2016, but ended the year with a market share below that of its nearest competitor, Apple's iOS. The two rivals dominate the Japanese market, holding a share of almost 99 percent between them. In 2017, there were an estimated 107 million mobile phone users in Japan, of which some 55 percent owned a smartphone. A further 59 percent of mobile phone owners used their device to access the internet. Overall, almost 48 percent of Japan’s total population uses a smartphone, equivalent to over 60 million people. The smartphone games market is also a growing industry in Japan, with its value expected to double to around 8 billion U.S. dollars between 2012 and 2016. * ComTech tracks mobile phone behavior, including purchasing of phones, mobile phone bills/airtime, source of purchase and phone usage. The data excludes enterprise sales.